Set in a quiet forest, this sleepy little station is dripping with hand made scratch built charm and has a telegraph, a pot belly stove (with fire), and a station clerk who is often audibly asleep at the wheel. This soundtrack is subtle and may go unnoticed at moments, but there are always super details, and it WILL attract attention to itself. The snoring is a great gag, day or night. Also a natural for the garden, our Scale Magic imaging really works and sounds terrific outdoors! 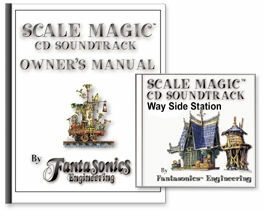 CD includes day & nighttime soundtracks.